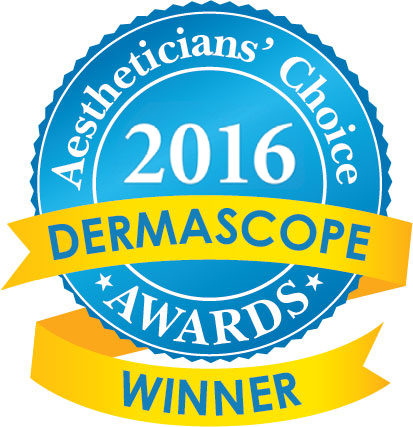 BEST BODY WRAP 2015 & 2016! Enhance - The Trio is the must have beauty essential for anyone looking to get the most out of their Bioslimming wraps. It's as easy as 1, 2, 3 to redefine your silhouette. Can be used on its own but recommended for use with a course of Bioslimming wraps. Bioslimming will help you to target the most important parts of the body (like the buttocks, the saddlebags etc…) Due to its unique formulation Bioslimming successfully targets the fat cells, addresses the connective tissue and circulation aspects of cellulite. One of its main ingredients is Caffeine, as a stimulant it means that its application to the affected areas increases the metabolism, helps increase blood flow and facilitates the swift burning of fat in the adjoining areas. Caffeine also plays a part in the fat burning process itself, this action is reinforced with the algae extracts used in the Bioslimming formulas. The Bioslimming Trio is designed to accelerate, enhance and maintain the results of the Bioslimming Professional Treatment. The Bioslimming Trio can be used on specific areas and by using it regularly allows women to target their problem areas with precision. Bioslimming addresses the problem at its core and this is one of the reasons why women who combine the Professional Treatment and the Trio Homecare are so successful in quickly reducing inches as well as reducing the appearance of their cellulite. Following your Bioslimming Professional Treatment at your local salon or spa it is best to start using the Bioslimming Trio the evening following your treatment, there is no need to apply it on the day of the professional wrap. The Trio can be used 2-3 times per week in-between your salon treatments however if you use it more often the results will be achieved quicker. Wash hands after application of the products or apply products with disposable gloves. 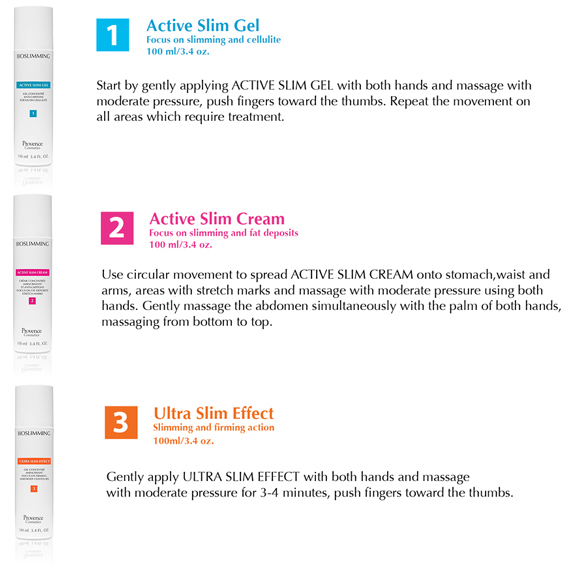 Always apply ULTRA SLIM EFFECT on top of ACTIVE SLIM GEL and/or ACTIVE SLIM CREAM. Redness will appear after the application of the products and decreases within 2 to 3 hours. Avoid eye contact. We recommend not to apply the products if you are pregnant or breast-feeding due to the presence of essential oils. Remember that the products contain high levels of active ingredients and small amounts of each product is sufficient. You want the gels and creams to be absorbed by the skin and not lying on top. The Bioslimming Trio can be used on its own, and if so it would be advisable to use it every other night or more often to achieve desired results quicker. It is ideal to use prior to exercise to enhance results. The primary objectives of the study were to evaluate the slimming and anti-cellulite effects of the BIOSLIMMING treatment after a single application. 93% of the subjects found that their skin was smoother; 86% found that their skin was softer, firmer and felt more comfortable in their body, cellulite was visibly attenuated in 81% of subjects. 100% felt that it corresponded to expectations and enjoyed the treatment. Copyright 2015 all rights reserved. Product related data is courtesy of Provence Cosmetics.